 Harvey Pekar, author of the long-running American Splendor nonfiction comic/ graphic novel, live at Frye Festival 2007.  "Domesticators" by Sheri-D Wilson.  "Buffalo" by Hilary Peach.  "Listen" by Andrea Thompson.  "In the Time Before" by Barbara Adler. sound: Screaming Trees "Shadow of the Season"
This past week, when I went by the NB Filmmakers' Co-op on bike I went behind the building, the Charlotte Street Arts Centre to lock my bike to the fire escape. 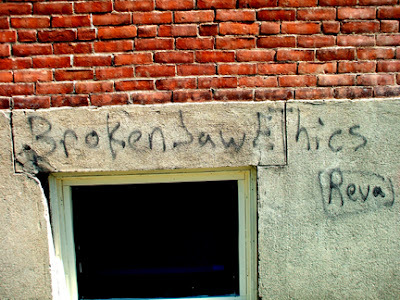 Found this "Broken Jaw Ethics" graffiti on the wall. I didn't do it. Haven't heard about it from anyone else. Wonder how long it's been there . . . ? The Canada Council for the Arts is celebrating its 50th anniversary this year. Anniversaries are occasions for celebrating the achievements of the past, but they also provide an opportunity for looking to the future. The Canada Council is in the process of developing a strategic plan for 2008-2011, to guide the Council’s programs and priorities over the three-year period. We are inviting you to participate in this process, by giving us your thoughts on where the Council should be going in the short- and long-term. As of May 14, a discussion paper will be posted on the Canada Council’s web site at canadacouncil.ca/en/consultation. We would appreciate your reading the discussion paper and sending us your ideas and suggestions by June 15. Your opinion – and especially your responses to the questions in this paper – will inform and enrich the strategic plan and provide ideas and inspiration for the long-term development of the Council. The Council will also be meeting with national arts service organizations on June 18 to discuss together the strategic plan. If you are a member of a national arts service association, you can also provide input through your membership. 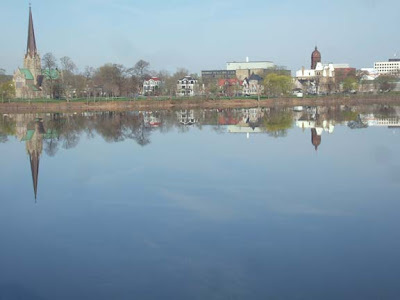 The Council’s strategic plan will be developed over the summer and early fall, and will be reviewed by the board of the Canada Council during its 50th anniversary meeting in Montreal in October 2007. Once approved by the board, it will be released to the public and posted on the Council’s web site. Cette année, le Conseil des Arts du Canada célèbre son 50e anniversaire et, comme tous les anniversaires, celui-ci représente un moment privilégié pour célébrer nos réalisations, ainsi qu’une excellente occasion de contempler notre avenir. Le Conseil des Arts a entrepris de développer un plan stratégique visant la période de 2008 à 2011 : le plan guidera les programmes et les priorités du Conseil pendant ces trois années. Par la présente, nous vous invitons à participer à ce processus, en nous communiquant vos idées sur les orientations que le Conseil devrait suivre à court et à long terme. À compter du 14 mai, un document de discussion sera affiché sur le site web du Conseil, à l’adresse www.conseildesarts.ca. Nous vous saurions gré de lire le document de discussion et de nous communiquer vos idées et vos suggestions au plus tard le 15 juin. Votre opinion – notamment vos réponses aux différentes questions posées dans le document – contribueront à la conception d’un meilleur plan stratégique et serviront d’inspiration pour l’évolution à plus long terme du Conseil. Le 18 juin, le Conseil rencontrera ensemble les organismes nationaux de services aux arts et discutera avec eux du plan stratégique. Si vous êtes membre d’une association nationale de services aux arts, vous pourrez aussi participer au processus comme membre de ces organismes. Le plan stratégique du Conseil des Arts sera élaboré pendant l’été et au début de l’automne; le document sera révisé par le conseil d’administration de l’organisme à sa réunion prévue à Montréal en octobre 2007, pour célébrer son 50e anniversaire. Une fois approuvé par le conseil d’administration, le document sera publié et affiché sur le site web du Conseil des Arts du Canada. Nous anticipons avec plaisir de connaître vos points de vue. D’ici là, acceptez, chers collègues, mes sincères salutations. sound: NIN "That's What I Get"
leave crete; how long has it been? did neil armstrong discover the moon? Seriously blonde hair and tan, and a hand-painted shirt I made at a youth hostel in Belgium in August before I crossed the Channel and went north to Scotland, this is me, September 1983, back in Dartmouth, after four months travelling around Western Europe, England, Wales & Scotland. Photo was taken by my mother against the house wall. 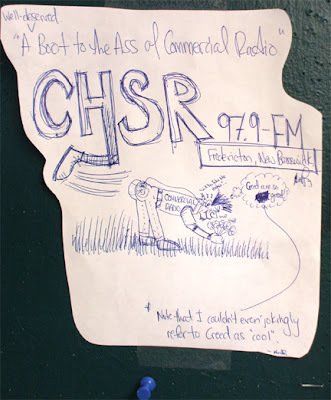 Just under 20 years ago, I went to New York City for a term of Off Campus studies as the first half of the final year of my BFA S(tudio major in Intermedia) @ NSCAD. My anchor in New York was a curatorial internship at the New Museum of Contemporary Art on Broadway [I was the first Canadian to do so]. Bur I also took in plenty of other art & writing activities during my four intense months in the Big Apple. Took many photographs . . . 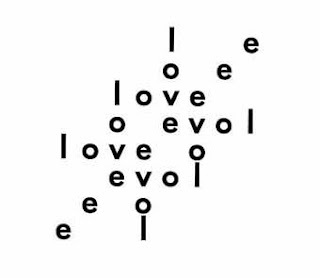 Yesterday, while going through a mountaineous pile of paper, albums, binders and boxes to ferret out the originals of concrete/visual poems for an anthology due out next year, I found several photo prints including the one below. I had heard about the Guerrilla Girls at NSCAD, before going to NYC. This poster and other activist actions of theirs were truly incredible, and totaly necessary. This group of women artists came together in 1985 to draw attention to issues and inequalities in the art world. With the assumed names of dead women artists, they wore gorilla masks in public, potested, and performed interventions. 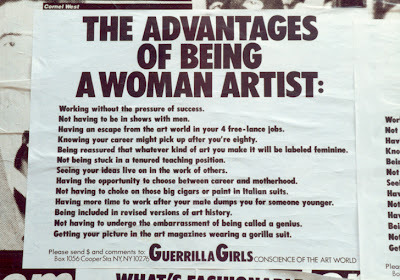 I wasn't surprised today to find the Guerrilla Girls online and still fighting the good fight because the art world continues to be male-dominated and -controlled. One can buy framable copies of the current version of this poster and many other posters, stickers, T-shirts, etc. to raise local awareness whereever one is and to financially support Guerrilla Girls' ongoing activities. sound: Violent Femmes "Color Me Once"
Back in the Days before computers took over visual communication design I was a sometimes cheeky one at NSCAD. 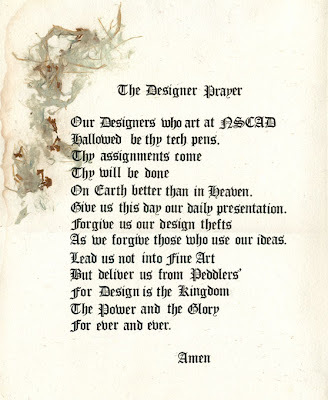 Was in VisCom 1 in the spring of 1985 when I filked "The Lord's Prayer". In the weird contradictions of the times used Letraset on a sheet of handcrafted paper by K. Reith Blake to make this poster/piece. sound: Peter Gabriel "Shock the Monkey"
The Havana recital is within the context of the XII Festival Internacional de Poesía de La Habana, May 28-June 2, 2007, supported by Proyecto Cultural Sur, and Unión de Escritores y Artistas de Cuba, la Oficina del Historiador de la Ciudad, la Comisión Nacional Cubana de la UNESCO, la Sociedad de Beneficencia de Andalucía y el Centro Cultural Dulce María Loynaz.  Asunción (Paraguay)  Bologna (Italia)  Dolores (Buenos Aires, Argentina)  Douglas (New Brunswick, Canada)  Fredericton (New Brunswick, Canada)  Guadalajara (Jalisco, México)  Lanusei (Sardegna, Italia)  Luján (Buenos Aires, Argentina)  Magdalena (Perú)  Málaga (España)  México, DF (México)  Morón (Buenos Aires, Argentina)  Pachuca (Hidalgo, México)  Recife (Brasil)  San José (Costa Rica)  San Salvador (El Salvador)  Saskatoon (Saskatchewan, Canadá)  etc. 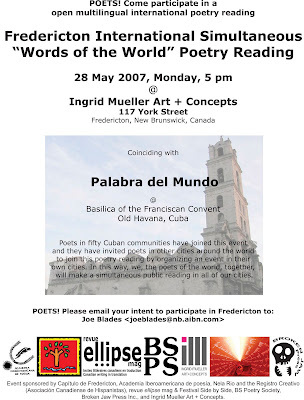 Fredericton poet-performers include Joe Blades, Ed Gates, Kimberley Gautreau, WhiteFeather and more, hopefully many more . . .
T-shirt: P.E.N. is mightier than the sword. Looking out my livingroom/studio window I see slightly different Fredericton sights than usual. 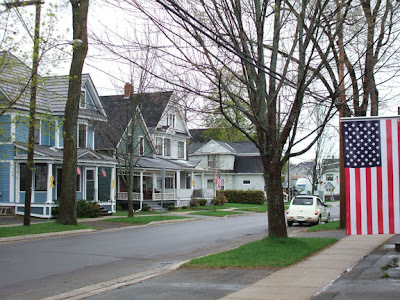 The blocks of George Street between York and Northumberland were dressed last night with USA flags and yellow Support Our Troops plasboard ribbons on houses. 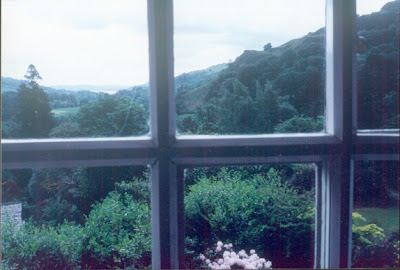 I'm suspecting that some of the scenes for Sticks and Stones will be shot there today. I have to head out very soon, by way of the credit union, possibly Victory Meat, and the NB Filmmakers' Co-operative [for a headshot by Bridgitte], to get to base camp and my first day on this movie as an extra. 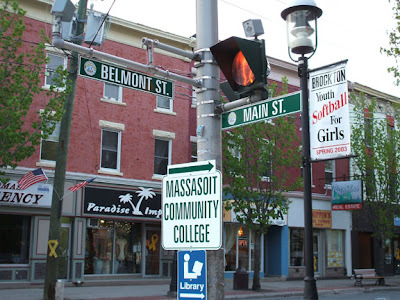 The new and temporary downtown "Brockton, MA" on the corner of York and King streets. BookExpo's VIDEO SHOOT OUT wants to offer one lucky indie artist the chance to win a complete BookShorts video production package complete with post-production. Think of a cool video idea about your zine or your indie print project and pitch it to BookShorts-on screen! Need to get inspired? Check out some indie-created productions we love at BrokenPencil.com. Fill out the entry form at www.brokenpencil.com/bookshorts. Send it along with your video pitch. Make sure you send that gem before midnight on May 24, or else you will be sad. Forward the contest to everyone you know. There is nothing wrong with a little competition. Makes the juices flow. May 25 - Visit BookShorts.com to see ALL the fab video-idea-gems, and we'll announce the Shoot-Out Winner. 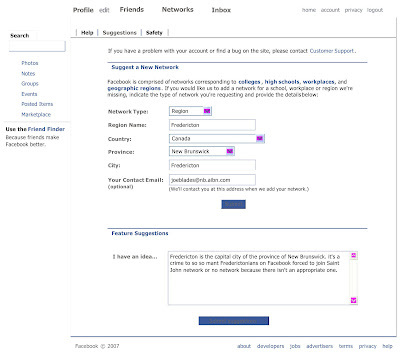 It would be even better if more people make the suggestion to them. Then they'll reall get the message and would be more inclined to make it so. T-shirt(s): Tidal Wave Film Festival 2002 & Brier Island is for the birds! 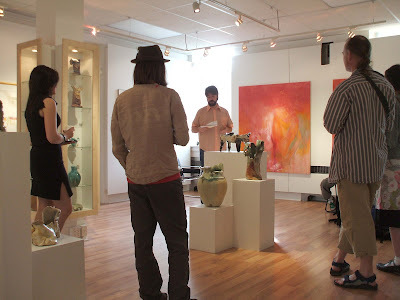 Eric Hill, of recently formed BlackTop Motorcycle Gang, reading yesterday as part of Surge!THREE (part 1) @ Ingrid Muller, Art + Concepts, @ 117 York St, Fredericton, NB. Artist Deanna Musgrave, giant Chris Giles, and BiffMitchell.com (and other not shown audience members) watch & listen. Exhibition opening there 2-5 pm today, for Frontiers by Mary White. A library in the Victoria School of Performing and Visual Arts was destroyed by fire 9 April. Damage is estimated at $2 million. 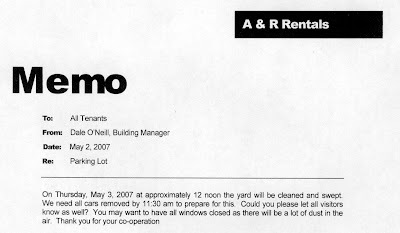 Mail to: 10210 108 Ave NW, Edmonton AB T5H 1A8. Friday, June 8, 1:303:00 pm. Location: Evergreen Room, Lister Centre, 87 Ave & 116 ST, University of Alberta. The format of this panel will include a screening of videopoems, or excerpts of video/film poems by other LCP members. It may also include screenings of videopoems being produced by students of the Victoria School of Performing and Visual Arts. i created and named broken jaw press in the winter of 198384 while working in banff before starting studies at nscad in halifax. i don't even recall when in the years since then I started to sometimes refer to myself as Broke Joe and/or Broken Joe . . . somewhen back there. this blog, I started in august 2005. i named it brokenjoe without question or the least suspicion that anyone else was also using the name. i don't have a CD out. i haven't recorded or published anything anywhere with the brokenjoe or Broken Joe moniker other than this blog and my newer blog.myspace.com/brokenjoe because so many of the other [SWAN]s are on MySpace and it's easier to link from within . 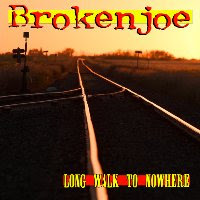 . .
my question, if anyone is paying attention to this blog, is what do i do, if anything, about this brokenjoe band out of toronto the good, or what do i do about me and my brokejoe blogs? slow joe not in the least snappy decided to bike to work today. it was a sunny morning. no breeze. should be good to go by way of marysville. get to the steps by 9 am. 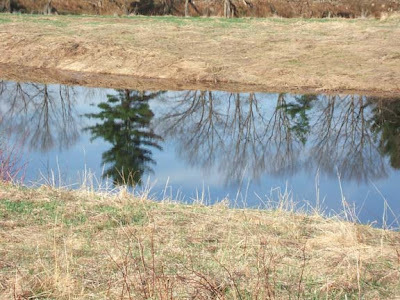 A disconnected reflect of pine and other trees in a nashwacksis flooded field. on the ground under the hardwood, the fiddleheads, trout lily and red trillium are bold colour against the faded grey and browns of last year's foliage and ground cover. 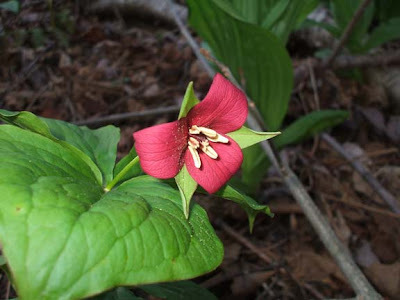 ontario has claimed the white trillium, and that's great for them, but i prefer the red almost burgandy trillium for its colour burst. 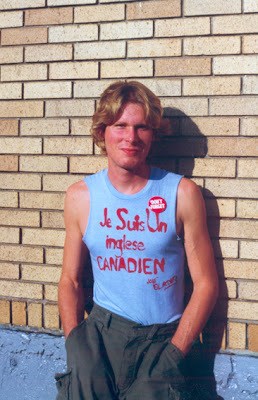 The bpNichol Chapbook Award was established in 1984,to encourage and inspire Canadian poets and new poetry. Each year, $1000 is awarded to the best poetry chapbook in English, published in Canada. This will be the first time we announce and present the award at a celebratory dinner & fundraiser. It will be a fun evening of food, entertainment, selected poetry readings and a silent auction. Admission is $75 per person and includes a 3-course dinner (of that amount, $50 is eligible for a receipt for income tax purposes.) All proceeds will go directly toward increasing the amount of the award, establishing a 2nd and 3rd prize, and raising awareness of bpNichol and chapbook poetry. Emcee, Luciano Iacobelli. Guest Speaker, Nick Mancuso. Seating is limited, so please reserve early! For tickets contact: Natalie, 416-964-3380. If you are unable to attend, but would like to make a donation, please send a check or money order to: Phoenix Community Works Foundation, 505-344 Bloor St W, Toronto ON M5S 3A7. Tel: 416-964-3380, Fax: 416-964-8516. Charitable Tax Number 13096 2277 RR0001. A tax receipt is available for all donations of $30 dollars or more. Email: info@pcwf.ca, website: www.pcwf.ca. The man at the front of the bus—grizzled, dressed in black sweater and shirt, grey slacks—held a white Styrofoam pellet container with red-lettered tape encircling it. I expected to read that it contained human blood, as I’ve regularly seen containers of that transported on Acadian buses. Along with live chicks, bedding plants and trees, the canisters of feature-length movies. When the man lifted the handled container, it swung around from CAUTION / FRAGILE warnings to CONTAINS HUMAN EYES—IN GLASS JARS. The eyes of the dead en route to possibly giving welcome sight to someone else. What a gift! What incredible small gifts those human eyes will make. Someday, it might be my eyes—burnt from so many years of close detail work—inside such a container of glass jars. I’ve signed-off on the organ donor component of my driver’s licence and that information must be in the barcode or magnetic strip on the card’s back. When I renew my licence, I put a checkmark and sign as requested. I’m willing to share what little I have. and i go . . .
sound: Bon Jovi "Someday I'll be Saturday Night"
This is for real! It’s your chance to be heard . . . on your terms. It’s the very first NO LIMITS 12 HOUR READ-A-THON. It’s on Saturday, May 19 and it’s sponsored by the Maritime Writers’ Workshop and Literary Festival. It’s all over downtown Fredericton and there are no . . . absolutely no . . . limits on what you can read. No limits on who or what you are . . . you can be a writer, you can be a not-writer. You can read something you’ve written or something somebody else has written. 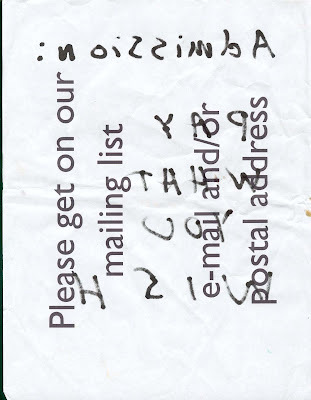 You can read your favorite letter you’ve received from an old friend. You can read your favorite piece of documentation. You can read your favorite poem. You can read from your blog. You can read from somebody else’s blog. You can read a short story you’ve written. There are NO LIMITS. You can be 9 years old or 90 years old. You can be a journalist or somebody who reads newspapers and magazines. You can be a sidewalk bard, a folk singer, a river poet, a radio copy writer, a computer documentation writer, an annual report writer . . . there are NO LIMITS! If you’re interested send me an email at biff@biffmitchell.com or send Andrew Titus an email at atitus@unb.ca. We need to hear from you soon because Fredericton’s very first NO LIMITS 12 HOUR READ-A-THON is just 17 days away. PLUS . . . there will be a poetry slam, a reading on the Green, a special venue for kids! And please . . . forward this email to as many people as you can think of who might be interested in reading ANYTHING they’ve written, or anything anybody else has written . . . like the lyrics to their favorite Doors song, or the funniest for sale sign they’ve seen on a bulletin board, or . . .
tonight's show was a straight-forward serving of the Frye Fest's Dialogue between authors Patrick Lane and Bernice Eisenstein followed by two pieces by Dwayne Morgan: "For the Love of Money" and "My Declaration of War". T: "I Will Not Make Boring Art"